The ability to preserve a Virtual Machine's "virtual hardware personality" during an export has been around since the release of vSphere and vCloud Director 5.1 also known as a Lossless OVF Export. However, when it comes time to import that Virtual Machine back into your environment, will it be a "lossless" import? For vSphere, the answer is yes as long as you click on the "Accept extra configuration options" during the import of your OVF/OVA in the vSphere Web Client. For vCloud Director however, the answer is sadly no. If you try to import an OVF/OVA that contains additional VM advanced settings, vCloud Director will automatically strip away these parameters before importing the Virtual Machine. As annoying as this is for end users, there is a very good reason why this happens. In a public cloud you do not know who your users are and whether they have malicious intentions. Since the "Extra Configuration" of a Virtual Machine can not be validated, the safest way to guard against this type of a security risk is by sanitizing the content prior to upload. Although I have known about this default behavior in vCloud Director for some time now, it was only in a recent meeting with some of our internal folks managing our OneCloud environment did I realize how annoying this behavior was for "private" clouds as well. I was looking to import an existing OVF that contains several VM Advanced settings, but realized this would not be supported due to the sanitization of the OVF. 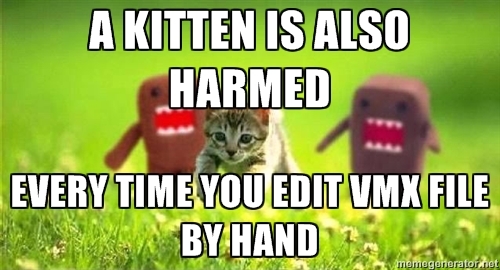 Disclaimer: This may or may not be officially supported by VMware, please use at your own risk. In doing a quick bit of research, it turns out this is actually a pretty elegant solution that allows you to create a "Whitelist" of trusted VM advanced settings that would be accepted as part of the import process in vCloud Director. To configure this "Whitelist", you will need to add a new category called ExtraConfigWhitelist into the vCloud Director Database for each and every VM advanced setting that you wish to allow. Note: The syntax used here is for an Oracle database. You may need to tweak it if you are using MS SQL Server. Once the VCD service has returned, you can now import any OVF/OVA that contains a list of approved VM advanced settings and VCD will ensure these settings are preserved as part of the import. 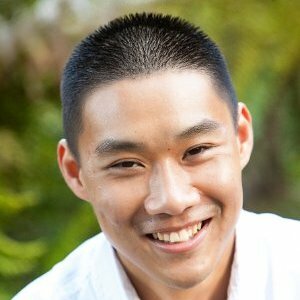 I hope this solution is something our OneCloud team will consider as it solves my immediate problem but I also think this can greatly benefit the overall use base, especially those building out content. Note: Even though this "whitelist" option is available, I would still recommend you carefully determine which VM advanced setting is required for your environment and minimize the size of the list as much as possible from an operational perspective, especially when it comes to new installation or upgrades. There was an interesting question that was asked the other day about changing the hardware serial number for an Apple Mac OS X guest as the generated serial number is not compatible with services such as Apple Caching Service or iMessage. I recall seeing this question get asked awhile back, but I could not immediately find the answer but thanks to Darius Davis (VMware Engineer) who provided the quick answer. As mentioned by Darius, if you are running Mac OS X VM prior to 10.9 (Mavericks) you will need to add the following advanced VM setting by first powering it off and then add the above setting. There are two recommended ways of performing this change using either the vSphere C# Client or vSphere Web Client and instructions are listed below. 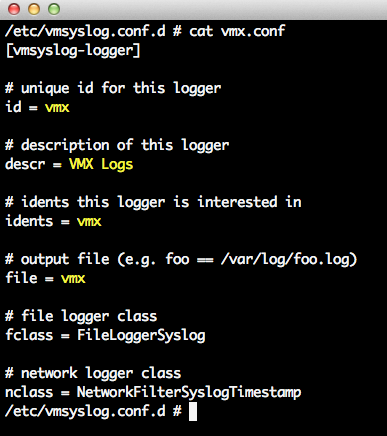 Note: Though you can also edit the VMX configuration file by hand, for those that are not familiar on how to reload the configuration file, it is best you use the UI. 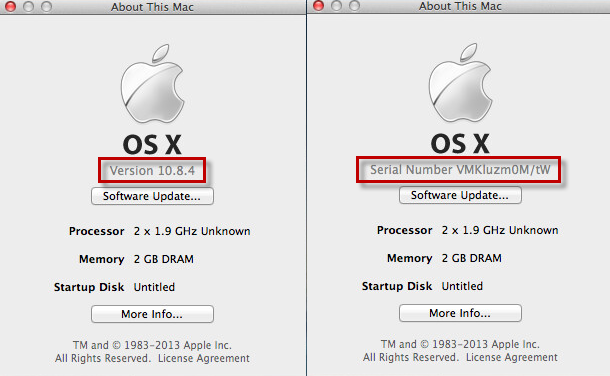 Once you have added the advanced setting, you can now power back on your Mac OS X VM and when you click on the "About this Mac" option on the upper left hand side of the Apple icon you should see the Mac OS X version string. Click on the version string twice and you should now see the serial number that is generated which should not be longer than 12 characters. As of writing this article the latest Mac OS X 10.9 (Mavericks) is not yet officially on the VMware HCL for latest release of ESXi 5.5 as the OS just came out recently, however it is still possible to create the a Mac OS X 10.9 guest using the new vSphere Web Client. 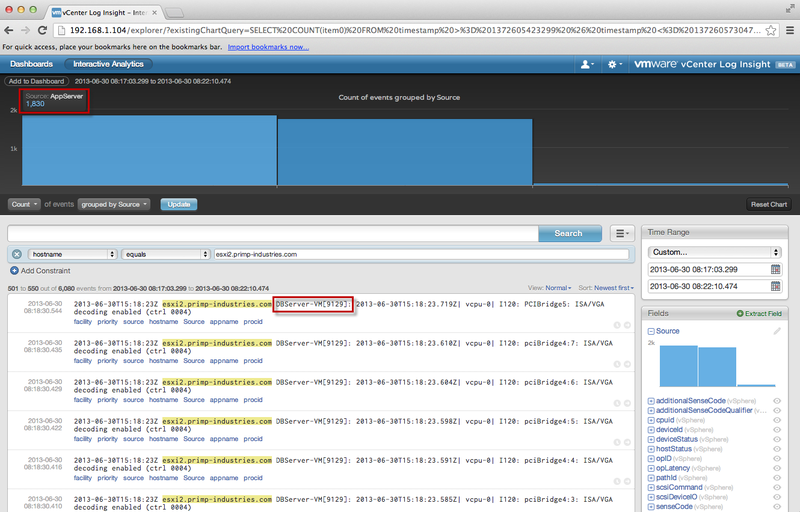 Be sure to keep your eyes on the VMware HCL for support of Mac OS X 10.9 on ESXi 5.5 here. 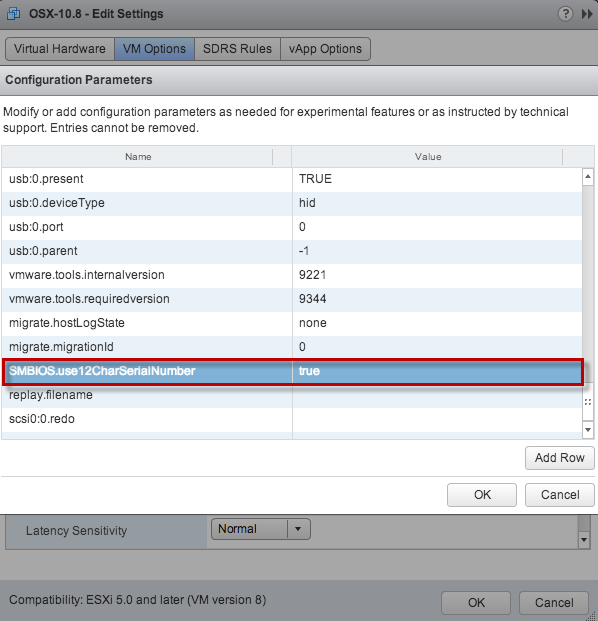 Last week I received a very interesting question from a fellow blogger asking whether it was possible to "pause" (not suspend) a virtual machine running on ESXi. Today ESXi only supports the suspend operation which saves the current memory state of a virtual machine to disk. With a "pause" operation, the memory state of the virtual machine is not saved to disk, it is still preserved in the physical memory of the ESXi host. The main difference with a "pause" operation is the allocated memory is not released and this allows you to quickly resume a virtual machine almost instantly at the cost of holding onto physical memory. The use case for this particular request was also quite interesting. The user had an NFS server that housed about 200 virtual machines that needed to be restarted and the goal was to minimize the impact to his virtual machines as much as possible. He opted out from suspending the virtual machines as it would have taken too long and decided on a more creative solution. He filled up the remainder capacity on the datastore which in effect caused all virtual machines to halt their I/O operations. Though not an ideal solution IMHO, this allowed him to restart the NFS server and then run a script for the virtual machines to retry their I/O operation once the NFS server was available again. Based on the above scenario, he asked if it was possible to "pause" the virtual machines similar to a capability Hyper-V provides today which would have provided him a quicker way to resume the virtual machines. Thinking about the question for a bit, a virtual machine is just a VMX process running in ESXi and I wondered if this process could be paused like a UNIX/Linux process using the "kill" command. Well, it turns out, it can be! Using the kill command, you can pause the VMX process by sending the STOP signal and to resume the VMX process, you can send the CONT signal. Before getting started, you will need to identify the PID (Process ID) for the virtual machine's VMX process. 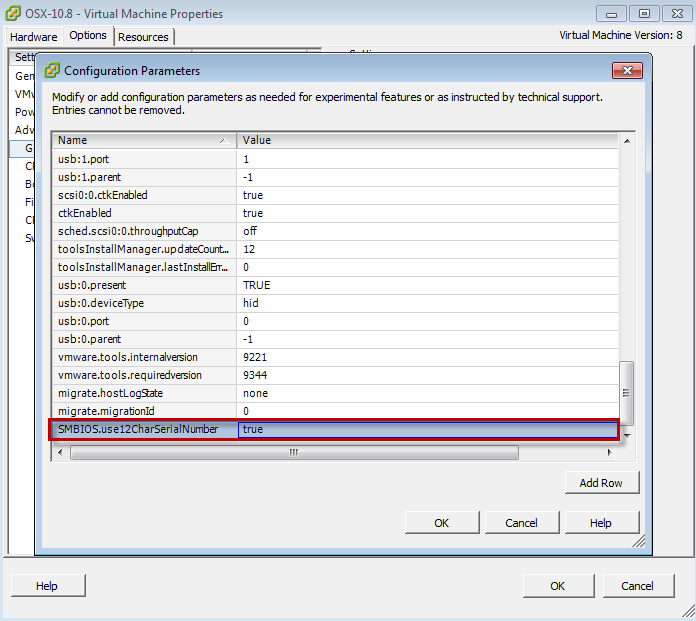 Note: Make sure you identify the parent PID of the virtual machine if you are using the above command as you will see multiple entries for the different VMX sub-processes. Here is a screenshot of pausing and then resuming the virtual machine. 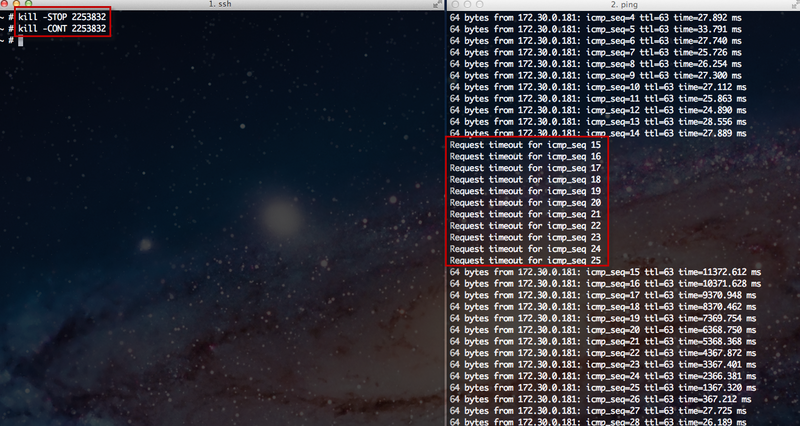 You can also see where the pings stop as the virtual machine is paused and then resumed. Once the virtual machine was resumed, it operated exactly where it left off with no issues as far as I can tell. 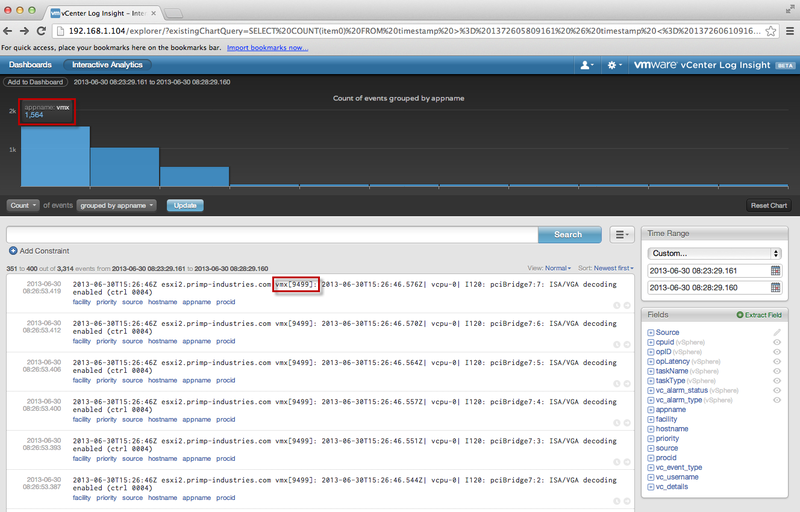 Note: I have found that if you have VM monitoring enabled, there maybe issues resuming the virtual machine. This should only be done if you have VM monitoring disabled as it may not be properly aware that the VMX process being paused on purpose.